bookerstreetbuffet: Bush and Bono, my blog theme this week. I love my country. The front man of the greatest rock band in the world was the guest speaker for the National Prayer Breakfast this morning. He spoke before President Bush and members of Congress, the cabinet, the military, the clergy and countries from around the world asking for more US funds to go toward the world's poorest countries. Bono is helping with the ONE campaign and white braclets like the one I wear were given out. You can help by going to ONE . 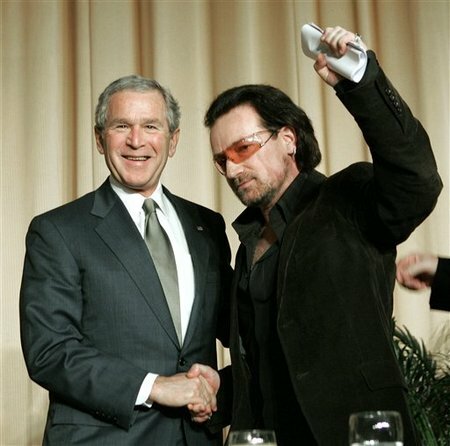 President Bush praised Bono as "a doer". 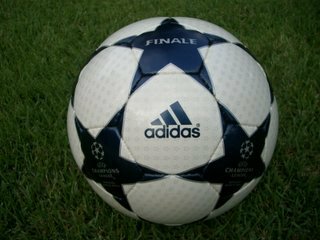 Corruption occurs on an individual basis, at the most basic level, which is the heart; the heart of a man or woman - or the heart of an organization, which is its people. Individuals can be corrupt. An organization like the U.N. is a figment. It is made up to give a name to the paper trail it leaves behind. You cannot burn the U.N. You cannot eat it. It doesn't exist... but the folks that run it do. To state that the United Nations is "corrupt" is something akin to asserting, "that red jumbo jet is corrupt." A jet, like any corporate body consisting of thousands of individuals, exists only in the constituent relationship of all its component parts. Bono needs to do what Bono does. I'm sure his "realization" concerning political tom-foolery came quite some time ago. He's playing the system. He's getting something accomplished. Like 'W' said, Bono's a doer. But - what about the U.S. Government? Is it corrupt? Or are a few bad-seed, bad-apple types corrupting it? If your fingernail is "corrupt", do you cut off your hand? Nope. If your hand is corrupt, do you cut off your arm? Not really. Corrupt is a relative term anyway. What fun. What a waste of time.